Let’s look at the best bump helmet that you can pick up in 2019. What is a bump helmet? A bump helmet is protective gear worn to protect your head and skull. A bump helmet in particular protects you against bumps, falls, and similar impacts. A bump helmet is NOT a ballistic helmet. A ballistic helmet may protect you from a range of high speed projectiles. That’s not what a bump helmet is for. Why would you need a bump helmet? First off, for tactical operations and law enforcement there is obviously a need for a bump helmet. But, bump helmets can be useful for recreational activities too – like whitewater rafting, skateboarding, kayaking, rock climbing, and more. Bump helmets are also used in Search And Rescue (SAR) operations, particularly in mountaineering situations. They are also a popular accessory for airsoft and LARPing. We’ll look at the best bump helmets from Team Wendy. Ops-Core and ESSTAC also have good models. 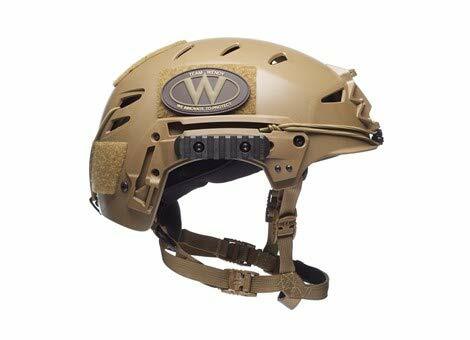 The Team Wendy EXFIL LTP Helmet (Buy on Amazon) is one o the best bump helmets. First of all this is the LTP model – Lightweight, Tactical, Polymer. This is mil-spec equipment made for serious business. Team Wendy is one of the biggest players in providing helmets to the military. Available in black or coyote brown – so it will meet the needs of the SWAT team or a military unit. The Coyote Brown color option is shown above. As we mentioned, the bump helmet’s primary job is to protect your skull from impacts. But, for tactical gear it helps with a lot of other things as well. One popular accessory by is NVGs – Night Vision Goggles. And for this the Team Wendy LTP has an NVG shroud with an integrated Wilcox® machined aluminum mounting plate. It also includes shock cord/bungee kit for stabilizing NVGs or goggles. And what’s that on the sides? Kind of looks like a picatinny rail. Yep – The LTP includes two Magpul® MOE® picatinny style rails and mounting hardware. These can be used to mount IR illuminators, flashlights, ear protectors, or comms devices. There’s also a patch hook and loop on the side, right above that rail. Use the hook and loop (aka velcro) to mount id or morale patches as needed. There’s also hook and loop on the back – use that to attach counter weights – or anything else. Communications headsets (comms) are also often used in the tactical environment – so the LTP has a high-cut shell for communications headset clearance. Is this a tough helmet? Yes, it meets all the performance requirements of the EN 1385:2012 standard for white water and canoeing helmets. The EN 1385:2012 standard requires rigorous testing using a variety of strikes and drops. It is still pretty light weight – at only 1.59 lbs (0.72 kg). Team Wendy also has a more expensive version made with Carbon Fiber. It is 2x the price. Shown here is the Team Wendy EXFIL Carbon Bump Helmet in Multicam. Whether you go for the LTP (Polymer) or Carbon (Carbon Fiber) option there are two sizes. Size 1 is for Medium/Large, and Size 2 (XL) is for those with a big noggin. The Carbon option also lets you use an optional TPU liner (Thermoplastic Urethane) for even greater impact protection. The Carbon with with that Revolve TPU Liner option (vs the Zorbium foam linter) meets ACH Blunt Impact (AR/PD10-02, 16Dec’13) standards. Here’s the back of the EXFIL Carbon, showing the hook and loop, and other features. Lastly, for SWAT teams and Law Enforcement Officers (LEO) we have an all black version. For SAR (Search And Rescue) operations you can also benefit from the Team Wendy gear. This version of the EXFIL is meant for SAR missions, and you can see they offer a variety of high visibility colors. This helmet doesn’t have all the tactical features of the other models, but it does have the important stuff. The picatinny rails are present – because using IR and Night Vision Goggles in SAR is definitely a possibility. It also has the Zorbium foam liner. And it’s got the same great basic features – the multi-strap retention system, one hand adjustments, etc. A bump helmet protects your head from impacts with objects and falls. It is not a ballistic helmet – which is a more thorough piece of protection gear. The model that is best for you depends on what you need. Recreational bump helmets don’t have a lot of accessories. 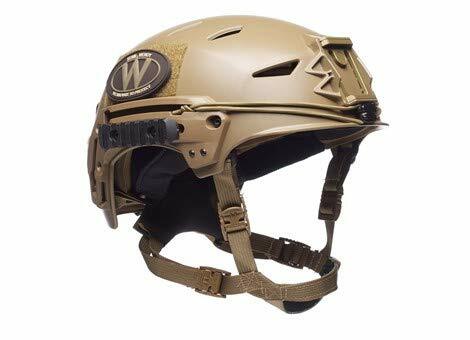 But bump helmets for tactical operations and law enforcement do have a lot of bells and whistles that you may need to consider. We are an Amazon affiliate. If you purchase through the Amazon links in this article we receive a small commission at no extra cost to you. This helps us bring you great content. We are also an Optics Planet affiliate. Similarly, if you purchase through those links in this article we receive a small fee, again at no extra cost to you. The photos used in this article are property of the manufacturer – Team Wendy. Who makes the best battle belt? We look at what you need in a good war belt - find out what the best gear is for 2019.